Williams is among Australia's most recognised artists. He is represented in all Australian public gallery collections and in major international galleries including MOMA and the Metropolitan Museum, New York and the Tate and V & A, London. He was awarded an OBE in 1976 and has won numerous art awards including the Wynne in 1966 for Upwey Landscape and in 1976 for Mount Kosciusko. Other prizes include the Trustees Watercolour Prize, Art Gallery of NSW in 1966, 76, 78 and the McCaughey in 1966, 71, 81. Williams was formally trained at the National Gallery School, Melbourne, the George Bell Art School and from 1951-56 the Chelsea School of Art and Central Art School, London. He returned to Australia in 1957 but on winning the Helena Rubinstein Travelling Art Scholarship returned to Europe in 1964. He spent the rest of his life in Australia, mainly in Victoria. Up to 1957 Williams work was predominantly figurative. From the years in London there is a large body of etchings thematic of London street life and music halls. However, on arriving back in Australia Williams started to paint landscapes. He was struck by the contrast between English and Australian countryside and according to Robert Lindsay^ thought landscape painting was the most relevant in the Australian context and wished to challenge the Australian masters. 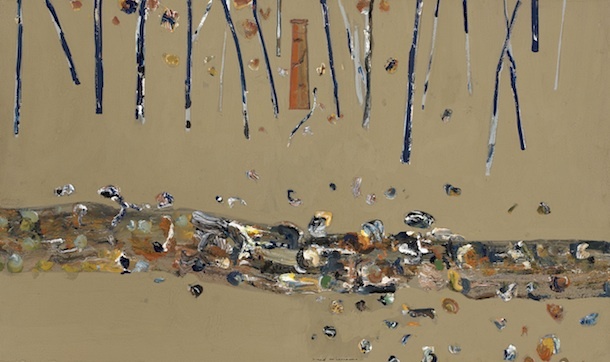 Williams is recorded as saying 'I don't like the bush very much'.^ This approach has meant his art reflects a detached view excluding any sentimental or romanticised notions; he even sees the vegetation as foreign, like himself, in what is sometimes portrayed as an inhospitable land. In portraying the land Williams takes an aerial perspective and creates a painterly abstraction using dots, dashes and slashes. Gradually Williams refined his markings attempting a minimalist calligraphy: 'I'm trying to incorporate everything there, so that all the atmosphere is reduced to one spot of paint'.^^ His work further developed to incorporate colour and climatic and individual topological details. The later works become more realistic and incorporates a simpler linear structure. Throughout his career he has worked in series counterbalancing one series against another: they respond to each other. The first You Yang Series 1962-64 and then the Upwey Series of 1965-66 established his reputation as a major Australian artist.